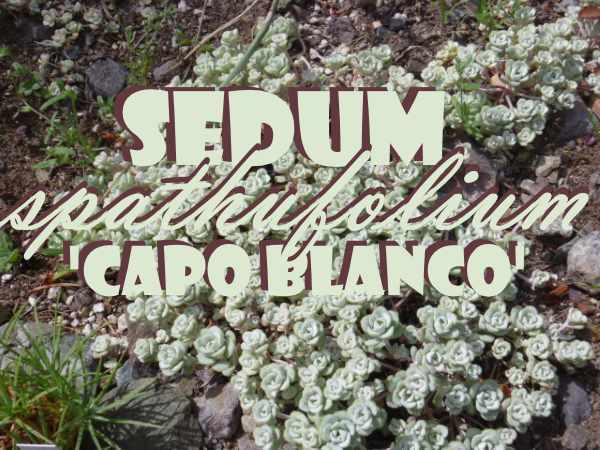 Sedum spathufolium 'Cape Blanco' or 'Capo Blanco' is one of the most 'bloomed' of all Sedum. The bloom is a waxy coating to prevent moisture loss from the leaves, similar to that found on plums and grapes. This makes the plant from a distance appear white or silvery, very pretty in an extensive planting. When cooler weather arrives, and even into the spring, the leaves take on a plummy pink colour. The flowers are held on short 4-6cm stems and are bright golden. 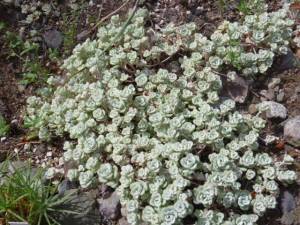 I plant Sedum spathufolium 'Cape Blanco' in trough gardens and containers, as well as rockeries. Very pretty and different looking. There are two other very similar types; Sedum spathufolium (the species) which is native to the west coast of North America, and the lovely purple type which has bigger leaves and a distinctive plummy shade to the foliage.